We Are The Wilderness is an emerging indie rock/electronic duo hailing from Brooklyn , NY. 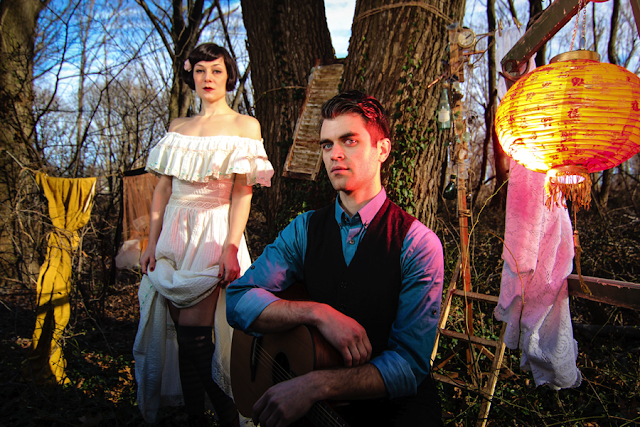 Shanda Woods and Ryan Manchester formed WATW in late 2010 and are releasing their debut LP, Descending From Paramount in May. Some of their most recent accomplishments include playing a showcase at CMJ 2012, SXSW 2013, which included a radio interview with Austin rock station KLBJ, headlining an event at Brooklyn's Cameo Music Gallery, and receiving a premiere from Baeble Music for their music video, Just For Now. Baeble Music also selected the Just For Now video as a Current Favorite and the video was a Trending Music Video for over a week after its premiere. We Are The Wilderness has also been interviewed by blogs such as Bushwick Nation and My Social List. We Are The Wilderness' live show uses a mix of electronics, live instruments, vocals, and interactive video projections to create an experience that engages their ever-growing fan base. The WATW fan base ranges from local die-hards (some driving three or more hours to catch the SXSW set) to international listeners. ReverbNation's Brooklyn indie charts list We Are The Wilderness in the Top 40 and many of indie rock's tastemakers follow them on Twitter and Facebook. Regardless of trends, We Are The Wilderness will always create quality, honest music for both themselves and those supporting this burgeoning act from the ground floor up. R. What's the origin of the bands name? Have you changed the band's name before? WATW. It's been We Are The Wilderness from the beginning. "We" is all of us. The function is inclusive, just as music should be. It's for everyone, if you want it to be. It's tiring to keep with trends and the specificity of person that certain types of indie music require, and it reminds us we are all connected and not required to be anything more than what we already are. The wilderness is something that can be anything known or unknown. We live in city, in organized streets, walls and rules, but there is constant chaos and constant uncertainty. The opposite can be said about nature to accountant for both ends of the spectrum in order to maintain equilibrium. The name reminds us to appreciate this balance, to cultivate awareness and care for it. Not just the human experience, but everything that makes up your world. R. What genre of music do you consider your work to be? Who are your major influences? WATW. We combine elements of electronic, indie, and classical music and we've heard that we are indietronic, but we try not to concern ourselves too much genre restrictions. Our major influences are Philip Glass, Radiohead, Modeselektor, and SBTRKT. There are many indie rock influences from the late 90s that got us into music and Sunny Day Real Estate and Modest Mouse are probably the most well known. R. What can you tell me about your instruments? (i.e., Are you subject to brand loyalty or will you play with whatever's available? What made you choose the instruments you have now? Was it cost r was it a style/model/brand/color preference? WATW. A number of factors go to our decision to acquiring instruments such as quality, cost, and functionality of that particular instrument. We don't subscribe to strict brand loyalty, but have a handful of brands we trust to perform over a long period of time. The instruments we have now each perform a specific role in the studio or on stage, and as far as style/color goes, we chose the instrument first, then look at available styles. Style doesn't necessarily affect our decision when we find something we like, but it's nice if it looks awesome too.Ryan loves his Fender telecaster and Shanda has new Blue stage mic that has a great sound. R. Who writes your songs? What the main themes or topics for most of your songs? Do you think these topics will change over time? WATW. We both the songs. Specifically, Shanda handles the lyrics and vocal melodies and Ryan writes the instrumental line and structure. We then take the pieces and weave them into a song together. On Descending From Paramount, the themes were based on experience and thoughts we have on life, death, spirituality, and how they all fit together. As our lives continue to change, so will our ways writing about these things, but these concepts and topics are universal and will always be relevant to the human soul. R. Could you briefly describe the music-making process? WATW. Ryan will usually have a basic sketch of instrumental lines to show Shanda. We then expand the sketch into a real song. The Shanda write lyrics and a vocal melody. Sometimes Shanda will have lyrics and Ryan will write based on those. On a few occasions we have done all of this at the same time and have written a song in matter of minutes. There is no static process, as we write what we feel when we feel it. We both work finalizing the vocal melodies, then write out backing vocal lines. We may change a few things even after everything is tracked. We both have equal say in what makes the final mix. We believe a completely democratic approach will only strengthen the final product. R. Leading from Emptiness is the new track from your new album Descending from Paramount. What is the message behind the title? WATW. It's basically expressing a movement away from being completely wrapped up in another human being. That so many times we search for someone to complete our lives, when really that person can tear our lives apart. People come in and out of our lives for a purpose, and when we realize that, there's fulfillment instead of emptiness. R. Finish this sentence. "I have a dream..."
WATW. that the world wakes from it's slumber so humanity can fulfill it's highest potential.